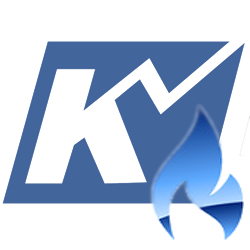 Natural Gas Archives - Page 6 of 12 - Kase and Company, Inc. The spread between the June and July contracts ahead of June’s expiration on Thursday has weighed on the front of the market. However, July natural gas challenged crucial support at $2.13 Wednesday and held this level on a closing basis while June stalled again near key support at $1.95. The longer-term is beginning to look more positive for natural gas, and once June expires, July is poised to rise toward key resistance at $2.31. Wednesday’s close over $2.17, the midpoint of Tuesday, was positive for the near-term. Tomorrow, look for July to test $2.21. A close over this would then call for $2.25 and $2.31. Overcoming $2.31 would open the way for an extended move higher. Trading will likely remain choppy for the next few days, especially ahead of the holiday weekend, and $2.13 is still crucial support. It is in line with projections for the waves down from $2.427 and $2.327. 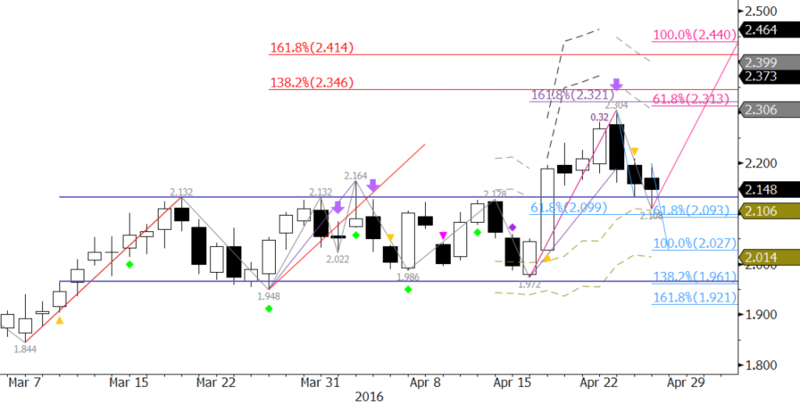 It is also near the 62 percent retracement of the move up from $1.939 to $2.427 and is the close of May 18. A close below $2.13 would call for $2.08 and possibly $2.00. July might test a bit lower, but we still do not see evidence that July will fall lower than $2.00. This is a brief natural gas forecast for the next day or so. 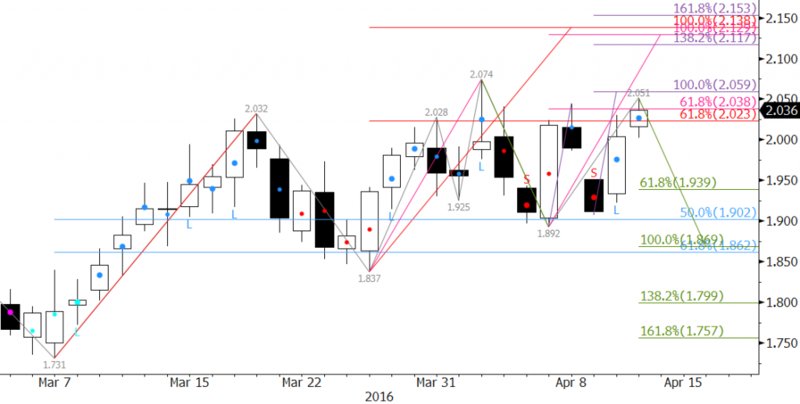 Our weekly Natural Gas Commentary is a much more detailed and thorough analysis. If you are interested in learning more, please sign up for a complimentary four-week trial. Natural gas continues to send mixed signals on a day-to-day basis. However, that is pretty typical for this time of year during the shoulder months ahead of summer. Natural gas is trying to gauge the prospects of a recovery or a continued decline over the course of the longer-term, but it needs to gather more information first. With all current factors considered, it is looking like natural gas is settling into another trading range, though the boundaries of the range are still being determined. For now, odds still favor a decline. 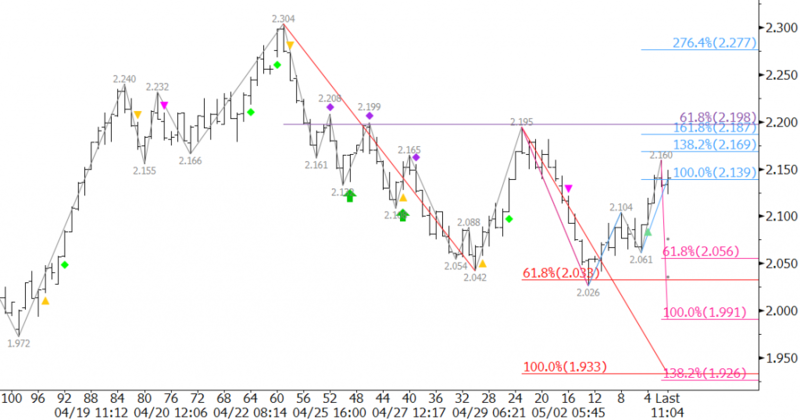 June natural gas met the 0.618 projection for the wave $2.304 – 2.042 – 2.195 at $2.026 on Monday. Waves that meet the 0.618 projection typically extend to the 1.00 projection, in this case $1.93. Therefore, unless $2.195 is overcome, odds ultimately favor $1.93. That said, the wave up from $2.026, aided by today’s close over $2.14, shows potential to extend to its 1.618 projection of $2.19. This is near the $2.195 swing high and the 62 percent retracement of the decline from $2.304 to $2.026. A move above $2.195 would take out the wave down from $2.304 that projects to $1.93 and lower, and in turn, shift odds in favor of $2.28 and higher. First support is $2.06, the 0.618 projection of the wave $2.195 – 2.026 – 2.16. A close below this would take out the wave up from $2.026 and the near-term potential of overcoming $2.195. This would also open the way for another attempt at $2.00 and lower. The key over the next few days will be either a move above $2.195 or below $2.061. As stated, odds favor the decline, but it is a very tight call right now. 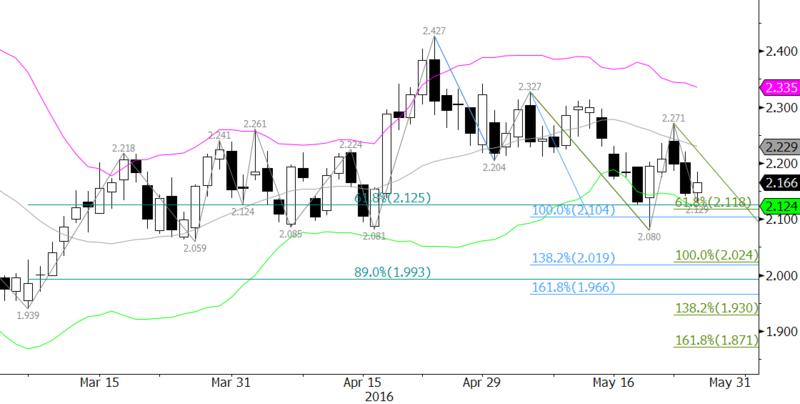 After breaking higher out of the recent trading range between nominally $1.96 and $2.13, June natural gas stalled at $2.304. This was just below important resistance at $2.33, which connects to $2.43. Monday’s bearish engulfing line and confirmed divergence (purple down arrow on KaseX) called for a test of $2.13. This was strong resistance between March 18 and April 18 and has now become support. So far, this level has held on a closing basis. Tomorrow’s EIA Natural Gas Storage Report is expected to show around a +70 Bcf build. This is higher than the +52 Bcf five-year average, and could aid in dropping prices below $2.13 again. A sustained close below $2.13 would call for $2.03 and $1.96 where range bound trading may again ensue. That said, the small move up from $2.108 late Wednesday may extend in early trading before the EIA report is released. Unless there is a much smaller than expected build reported by the EIA tomorrow, there is a cluster of resistance between $2.18 and $2.23 that should hold. A close over $2.23, the 62 percent retracement from $2.304 to $2.108, would call for $2.33 to be attempted again. Forecasts for warmer than normal temperatures next week in the Midwest and mid-Atlantic spurred natural gas higher on Tuesday. 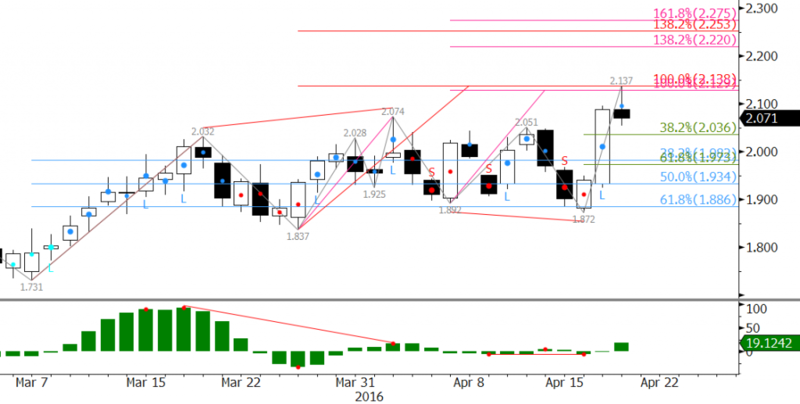 For several weeks the May natural gas contract oscillated in a range between approximately $1.86 and $2.04. The range was finally broken when prices settled above $2.04. That said, the move up may have been too much too soon. Early Wednesday, the 1.00 projection for the wave $1.731 – 2.032 – 1.837 was met at $2.137. For weeks, this is a target we have been following and have stated is a crucial wave projection and decision point. A close over $2.14 would call for an extended upward correction that could ultimately transition into a long-term recovery. We doubt this will be the case. The move up is most likely corrective, and the market is trying to establish an upper boundary for a longer-term range. However, the potential for a long-term recovery is there should prices sustain a close over $2.14. May has already pulled back from the $2.137 swing high and closed below an important $2.08 target on Wednesday. 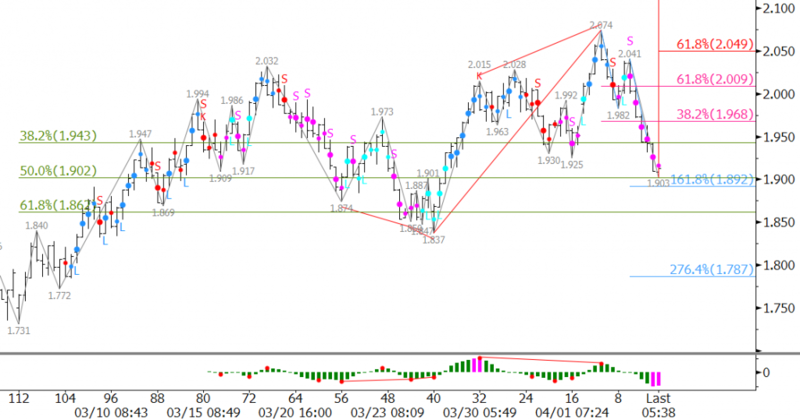 There are bearish daily divergence setups, confirmed intra-day overbought signals, and the wave formations call for a test of at least $2.04 on Thursday. A close below $2.04 would call for $1.97 and possibly $1.89. For the past few weeks, May natural gas has oscillated in a range between approximately $1.86 and $2.06. The market looks as though it wants to break higher after closing over Monday’s gap down from $1.99 on Tuesday and sustaining a close above $2.00 on Wednesday. May natural gas is working its way toward the crucial $2.06 target again after stalling early on Wednesday at $2.051. Support held and prices recovered late, but formed an evening star setup on the daily chart. It is still a very tough call, but currently, odds favor another test of $2.06 on Thursday. A close over this would call for $2.10 and likely $2.14 where there is a cluster of wave projections. However, keep in mind the move up is likely weather driven right now and corrective of the longer-term decline. Therefore, without help from external factors, the market will be hard pressed to overcome $2.14. Initial support at $1.98 should hold on Thursday, but crucial support will be $1.94. A close below $1.94 does not doom the prospects of the move up, but would open the way for a test of the key $1.86 level. Last week May natural gas formed a double top at $2.03. The confirmation point for the pattern was $1.837, the swing low between the two peaks of $2.032 and $2.028. May rose above the $2.03 double top, but failed to close over this crucial level on both Monday and Tuesday. This was negative and set the market up for a test of major support. Today’s close below the $1.925 swing low indicates May should now challenge the $1.837 swing low. A move below this would take out the wave up from $1.731 and significantly dampen the potential for the upward correction to continue. Look for initial support tomorrow at $1.86, the 62 percent retracement from $1.731 to $2.074. That said, the wave $2.074 – 1.982 – 2.041 met its 1.618 projection at $1.89. Therefore, be mindful of the potential for a small upward correction in early trading tomorrow. Currently, our models show resistance at $2.03 and $2.07. We expect $2.03 to hold. Natural gas entered into the injection season a bit earlier than normal, and as a result, prices have settled into a state of flux. It is too soon to say that a long-term bottom has been made, especially for the May contract. However, over the past few days the charts have shown that the upward correction is attempting to extend and that prices could soon rise to levels above $2.00. May natural gas stalled just below crucial resistance at $2.02 Wednesday morning. This is the 0.618 projection for the wave $1.731 – 2.032 – 1.837. The $2.02 target is key resistance for the near term because a sustained close over this would call for at least $2.14 as the 1.00 projection. At that point, the move up would still be corrective longer term, but would most likely confirm that a bottom has been made through at least the summer months. A normal pullback of the recent move up from $2.837 should hold $1.95. This is the 38 percent retracement from $1.837 to $2.015. However, the daily evening star setup that is formed on Wednesday indicates a pullback to $1.90 might take place. For the move up to continue, $1.90 must hold. This is the 62 percent retracement and the 0.618 projection of the wave $2.032 – 1.837 – 2.015. A close below $1.90 would shift odds in favor of a decline to $1.82 and lower. It looks as though the natural gas rally has stalled and that prices will most likely settle into a trading range. The move up had been resilient for the past few weeks, reaching a crucial target at $1.91 and nearly extending to key resistance just above $2.00. However, the lack of a positive shift in underlying fundamentals has put a lid on prices, for now. April natural gas is poised to test key support at $1.74 ahead of the holiday weekend. 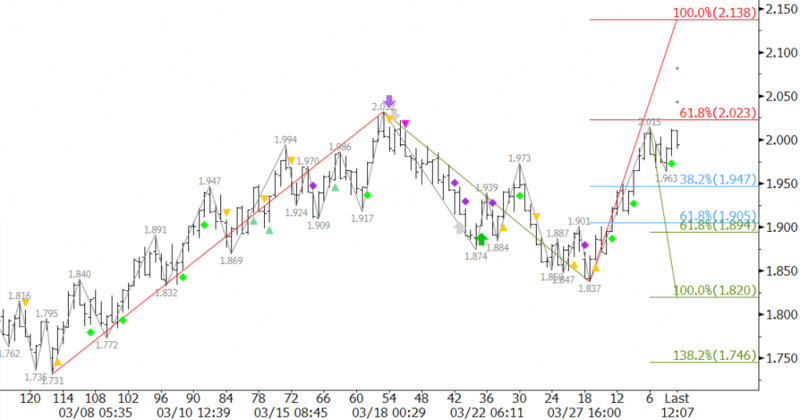 Wednesday’s close below $1.80, the 0.168 projection of the wave $1.957 – 1.796 – 1.899, has shifted odds strongly in favor of at least $1.74, the 1.00 projection. This is also the 62 percent retracement of the move up from $1.611 to $1.957. A close below $1.74 would call for $1.68 and very likely $1.65. The latter is the 1.618 projection, 89 percent retracement, and last support protecting the $1.611 low. Longer-term, the outlook for natural gas remains bearish. However, we do not foresee prices making new lows yet. The most likely scenario, during the first few weeks of injection season, is a trading range between nominally $1.65 and $1.95. This is similar to the type of range seen last year between $2.55 and $2.95. There is a reasonable chance that prices will test Wednesday’s $1.83 midpoint before declining to $1.74. This is also the 38 percent retracement of the move down from $1.899. A close over $1.83 would call for $1.90 again. This is key resistance because a move above $1.90 would wipe out the wave down from $1.957 and its potential to extend to $1.74 and lower. The highly anticipated natural gas correction is underway. 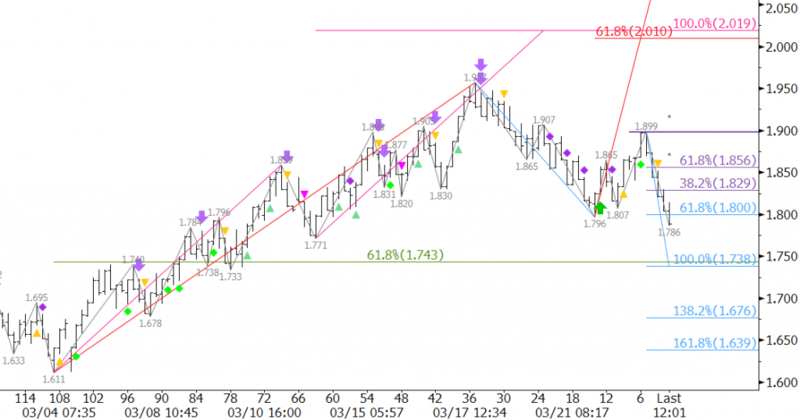 The wave $1.611 – 1.74 – 1.687 overcame its $1.758 0.618 projection Wednesday morning. The correction should extend to at least $1.81, the 1.00 projection. A close over $1.758 would have increased odds for $1.81. Nonetheless, as long as the $1.687 swing low holds on a closing basis the move up should extend. $1.81 connects to $1.86 as the 1.382 projection and 38 percent retracement of the decline from $2.223 to $1.611. $1.86 is a potential stalling point due to its confluence. 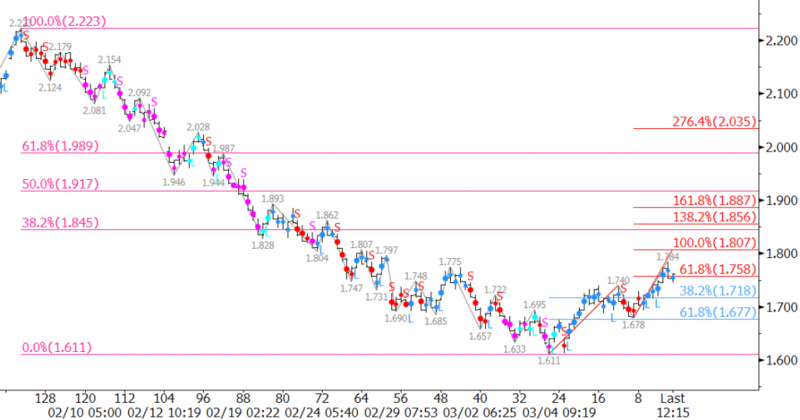 A close over $1.86 would call for $1.91, the 1.618 projection and 50 percent retracement. Key resistance is $2.00, the 62 percent retracement. As discussed in the weekly commentary, we doubt prices will overcome $2.00 without a bullish shift in underlying fundamentals. Key support is $1.68 because it is the 62 percent retracement of the move up from $1.611 and in line with the $1.687 swing low. A close below this would indicate the upward correction may be complete and would significantly dampen odds for $1.81 and higher.